Will: A will is a document that names an executor, the individual who will be responsible for handling your property upon your death. Also in a will you describe the property you own and name your beneficiaries — the people who should receive your property upon your death. A will is also the appropriate legal document to indicate your preferences as to who will care for your minor children in the event of your passing (legal guardianship). This is often your spouse, but in instances of simultaneous death a near relative or friend). As for your personal or real property, a will can cover only property that is in your name when you die; it does not cover property that is held with a joint tenant or that is in a trust. Though a will is not too complicated to revise it does require your assets to go through probate, a court system that verifies that your property is disbursed according to your will after your death. Probate requires your executor to provide an accounting (via receipts, invoices, canceled checks, etc.) to the court showing that your property was correctly distributed before it will approve and close your estate. In some circumstances probate can be time consuming and expensive resulting in a diminution of your estate. The creation of a will is typically less costly up front but in some instances more costly at the time of the distribution of the estate. Revocable Living Trust: Unlike a will that does not go into effect until you die, a trust begins at the time you create it. 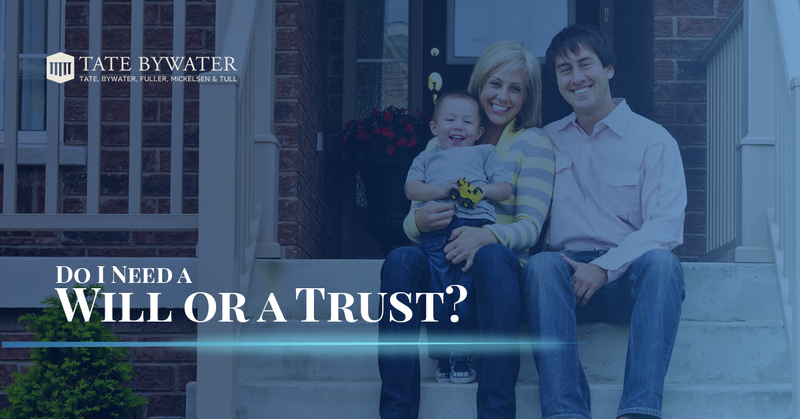 A trust requires the grantor (you) to appoint a trustee (sometimes yourself) who acts on behalf of the trust and manages the property for the benefit of the grantor and other beneficiaries. Often the grantor and the trustee are the same individual and is also a beneficiary. All of the assets that you intend to put into the trust (real estate, investment accounts, and personal property) must be re-titled in the name of the trust. The location of the assets does not change- it just means that instead of being held by an individual it is held by the trust. A major advantage of a trust is that its assets do not pass through probate and trust property can be passed to beneficiaries without court oversight or approval. The creation of a revocable trust is typically more costly up front but less costly and burdensome at the end. Wills and trusts each have their own advantages and disadvantages. The attorneys at TATE BYWATER have decades of experience helping people from all types of different backgrounds create an estate plan that can protect themselves and their loved ones for generations. We listen to you and make sure you understand and are comfortable with your estate plan prior to finalizing it. Contact our attorneys for a free consultation to discuss your unique situation to determine the estate plan that best fits your short and long-term needs.